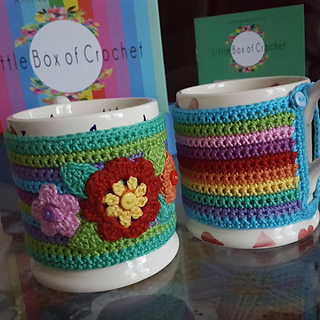 Two mug cosies; one rainbow striped, one striped with appliqué flowers. The finished size of each cosy measures approximately 8cm x 26cm. It is important that you create your mug hug to fit your own personal mug so please feel free to alter the foundation chain length and/or the number of rows to fit. Pattern released as part of Amanda Bloom’s Little Box Of Crochet subscription in the February 2017 box. Pattern uses nine Yarn and Color Must Have Minis (10g skeins) in Bronze (18), Sunflower (14), Red Wine (30), Peridot (83), Mint (76), Turquoise (65), Lavender (56), Plum (51) and Cotton Candy (37) to make both cosies and appliqué flowers. Additionally five small rainbow coloured buttons. Two for securing the cosies, three for part of the appliqué flowers.